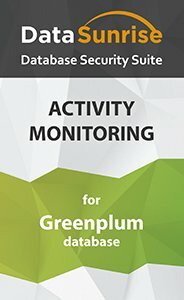 Greenplum activity monitoring solution by DataSunrise is designed to continuously monitor corporate network traffic in order to reveal unwanted actions of privileged users and attempts of hacking attacks. Providing detailed logs on user activities and changes made to database DAM solution becomes an irreplaceable tool during cybercrime investigation. It also helps to detect malicious company employees and mitigate the consequences of a data breach. Greenplum monitoring tool by DataSunrise monitors, captures and records events happening in multiple corporate databases in real time. The operation logs are stored outside the company network, thus there is no any opportunity to hide a transaction from DAM tool, even for database administrators. Privileged users also constitute a threat to the integrity and confidentiality of sensitive data. With DataSunrise you see every step of administrators, including security police update, modification of user accounts and permissions and system configuration changes. Audit logs contain detailed description of activities. Greenplum monitoring solution by DataSunrise in self-learning mode analyzes incoming traffic and identifies queries that are typical to given environment. Advanced filtration techniques reveal unusual operations and immediately alerts administrators, which allows to react as soon as possible and minimize risk of data breach. SQL injections, brute-force password cracking, sharing database username and other attempts of hacking activity are detected and recorded. The interface is convenient to work with and provides with useful features to automate activity monitoring process. The Greenplum monitoring tool is designed to be operated as simply as possible and it doesn’t cripple the server performance. It also supports Syslog protocol and can be integrated with SIEM systems. DataSunrise helps to adhere the regulations and laws in information security sphere (SOX, HIPAA, PCI-DSS). Data security of any organization starts from activity monitoring tool that provides the ability to see who and how queries your Greenplum database. It helps to detect SQL injections, hacking attempts and fraudulent actions of your own employees. Use Greenplum monitoring tools for cyber attack protection, privileged user and application activity monitoring.